You have probably heard the buzz about Light Therapy for pain, with countless professional athletes relying on this revolutionary, non-invasive treatment to reduce inflammation, enhance tissue regeneration, and manage acute and chronic pain. LED and Low-Level Laser Light Therapy is used in virtually every major professional sport, including athletes from the U.S. Postal Cycling Team, the National Football League, Major League Baseball, National Hockey League, Professional Golf Association, and various members of the U.S. Olympic Team. Unlike high power lasers that use heat to cut or cauterize tissue, LED and low energy cold lasers enhance biochemical reactions in the targeted tissue. In somewhat simple terms, visible light is directed to a specific area. The light energy passes through the skin, and is received within the cell membrane by special energy photon acceptors. The increase in intra-cellular energy results in altered cell membrane permeability, and physiological changes occur through an enzyme cascade to affect several biological processes. Within the injured musculoskeletal tissue, low-level light starts an increase in microcirculation and enhanced tissue regeneration, leading to decreased pain and inflammation, and increased mobility. Increased endorphin levels – Light therapy increases endorphin levels in human tissue and normalizes the action potential of the nervous system. 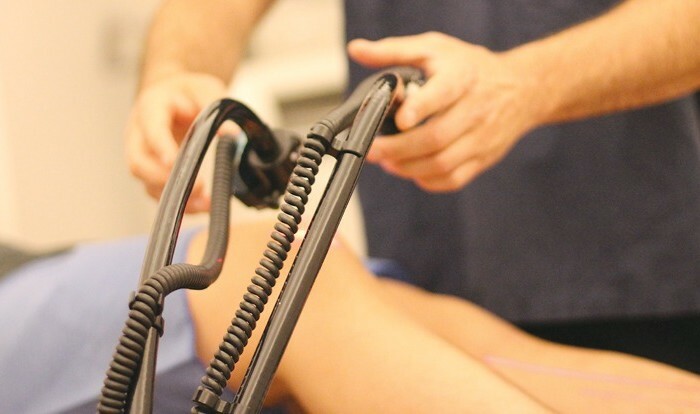 Faster Injury Recovery – Light therapy stimulates tissue granulation and connective tissue projections which are part of the healing process of wounds and inflamed tissue. Reduced Inflammation – Light therapy stimulates the lymphatic system to remove waste products and cellular debris from the treated area. Increased Cellular Energy – Light therapy accelerates energy production at the cellular level by activating the cell’s power plants [mitochondria] to increase production of adenosine triphospate (ATP). Increased Tissue Strength – Light therapy stimulates collagen synthesis and fibroblast activity for increased tissue strength. Studies have shown that injured tissues treated with infrared light are markedly stronger after recovery than with natural healing alone. Improved Circulation – Light therapy causes increased production of nitric oxide (NO) which creates a non-thermal vasodilatation of capillaries in the treatment area. The word “laser” is an acronym for Light Amplification by the Stimulated Emission of Radiation. The theory was first described by Albert Einstein (1879-1955) who paved the way for the development of the therapeutic laser. Cold lasers have been in use for over 25 years, with over 2000 published research studies and no recorded adverse side effect. The Erchonia Lasers used at SOL Physical Therapy made history by becoming the first to receive FDA approval for chronic pain treatment! Book a Light Therapy appointment today! Get yourself on the schedule and experience the healing effects of SOL Light Therapy.